The latest generation MCOS semi low-loaders with hydraulic steering are the optimal transport solution for the transport of medium-weight machinery (up to 47 tonnes) that is fast, cost-effective and safe. Until recently the switch from self-steering axles to hydraulic steering required considerably more investment. But within their SMART programme Nooteboom has made this a much more attractive proposition. Since the successful introduction of the MCOS semi low-loaders the market share for this vehicle has increased significantly and interest is still growing. KWS Infra too has recently put into operation their first 4-axle MCOS-58-04(EB) hydraulically steered semi low-loader. such as road planers. 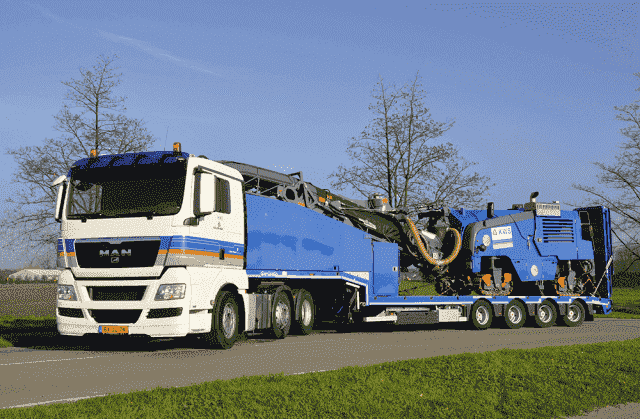 For the MCOS semi low-loader Nooteboom has upgraded the hydraulic steering to achieve an even larger steering angle without using a steering quickener. For this semi-trailer with swivel axles the steering angle is an impressive 45 degrees. KWS Infra is part of Royal VolkerWessels Stevin, a large, versatile group of companies with international operations in all sectors of the construction industry. In the Netherlands KWS Infra is market leader in the road construction sector. KWS has been a customer of Nooteboom for decades. During all those years KWS has acquired a huge fleet of Nooteboom semi low-loaders and trailers to transport their own road construction machinery, the latest addition being the 4-axle MCOS semi low-loader with hydraulic steering.